The majority of people fail to realise the influence these plans have over planning policy. These plans are constantly referred to and used as the framework when making planning decisions. A submission at the plan formation stage, followed up by targeted and reasoned lobbying can very often bear fruit, thus giving you a very real influence over planning policy in your area. Whether you wish to widen a road, protect a view, make sure land is not developed, protect a building with architectural or historical merit, extend or reduce a speed limit, obtain land for a primary school or a new playground for your community, these can all be submitted and included in the policy for a Local Area Plan, or a County Development Plan. It is especially important to make a submission if you are a property owner. you need to ensure that your land is appropriately zoned and no restrictions are being placed on your property. During the drafting process of these plans there are many opportunities to contribute and influence the plans. The council welcomes your idea and are very receptive to them provided they are of a certain standard. They expect the submission to consist of a high quality presentation, with correct technical content and clear reasoning. Here at Declan Noonan & Associates we can put your idea together for you so you can help yourself and your community have real influence on the development of your own locality. The Local Area Plan is a legal document and is a public statement of planning policies. It is prepared in consultation with the local community and members of the public. It sets out a strategy for the Proper Planning and Sustainable Development of an area, for example, village/town/district. The Plan seeks to provide a framework for how a town can develop. It provides some ideas as to how this development can be achieved, what new developments are needed, where public and private resource inputs are required, and some of the rules and regulations that will guide development in the district. It is valid for six years from the date of adoption by the Council. The Plan should be compatible with both regional and national guidance documents such as the National Spatial Strategy and the Regional Planning Guidelines. The Plan will have regard to the policies and objectives of the County Development Plan. It must respond to opportunities and challenges presented by the changing economic climate and promote continued economic and social development. All planning applications will be measured against the contents of the Plan. During its six year life, the development plan provides one of the key policy contexts for individual planning decisions in the development plan area. This presents distinct challenges to planning authorities across the system. For example, for cities, the development plan sets out how large urban areas will develop, while county development plans set out how large geographical areas will develop. The plan will influence capital investment by both the public and private sectors, including capital projects by the local authority itself. The plan must give spatial expression to the economic, social and cultural needs of the community, in terms of influencing new development, enhancing valued amenities, and protecting the environment and heritage. The development plan must be part of a systematic hierarchy of land use and spatial plans, including the National Spatial Strategy and regional planning guidelines. It must also be informed by the plans and strategies of the Government and other public agencies in general. Box 1 indicates the broad nature of the relationships between plans at different levels covering different areas. The development plan must provide a reasonable level of guidance for developers, the public and those involved in or responsible for making planning decisions within planning authorities. Finally, it must combine these diverse roles in an internally consistent way and in a logical and clear format. The National Spatial Strategy establishes a spatial policy framework at the national level and gives indicative land use guidance which is relevant at all levels within the planning hierarchy. 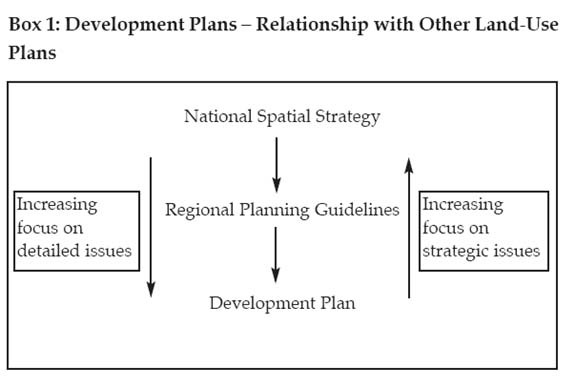 The formulation of plans at other levels must have regard to, and be consistent with the National Spatial Strategy. 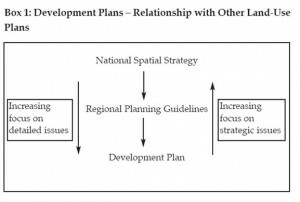 Regional Planning Guidelines operate within the national framework established by the National Spatial Strategy, while expanding on the National Spatial Strategy approach in more detail in relation to matters such as settlement, transportation and enterprise. Best practice guidance notes on the process of implementing Regional Planning Guidelines, with particular emphasis on ensuring that development plans support the implementation of the guidelines and the National Spatial Strategy, issued to regional and planning authorities. The Regional Planning Guidelines provide a long-term strategic planning framework for the development of regions. The planning frameworks set out in the guidelines take account of the future development of each region for the period of the National Spatial Strategy. The Strategy provides the context for the regional guidelines and these in turn provide the strategic framework for development plans, thus forming a hierarchy of planning policy from national to regional and local levels. Following the making of Regional Planning Guidelines for each region, it is recommended that a statement that positively affirms the Regional Planning Guidelines be inserted into existing development plans. A statement of the key interface areas between the guidelines and the development plan and any implementation priorities that may arise at local level as a result of the regional guidelines should also be included in the development plan. Development plans are a key focal point within the hierarchy. The development plan utilises national and regional frameworks such as the National Spatial Strategy and Regional Planning Guidelines to inform and structure land use policies at the city or county level, which in turn provide a basis for day-to-day planning decisions. • is situated within the functional area of a planning authority that is a county council. In providing development frameworks for particular areas, or parts of an area, local plans should address relevant issues in greater detail than in the development plan, but on a basis consistent with the approach of the development plan for the overall area. The development plan is thus the ‘parent’ document, which sets out the strategic framework within which the zoning and other objectives of the local area plan must be formulated. For example, the zoning of lands for use solely or primarily as residential development should have regard to the Council’s housing strategy. Development plans should indicate those areas for which a local area plan will be prepared, should set out a clear context for their preparation and give an indication of particular policies or objectives, which may need to be included therein. Local area plans are the level of forward planning closest to local communities and, therefore, the involvement of those communities in the plan-making process is essential. Planning authorities must engage with the providers of essential physical and social infrastructure and ensure local area plans are based on realistic assessments as to the funding and timing of the delivery of such infrastructure, recognising that some levels of strategic infrastructure may take a number of plan cycles to provide. The views and opinions of children and young persons must shape the policies and objectives of local area plans. Planning authorities, through their work with City and County Development Boards, will be aware of different groups and forums that represent the views of children and young persons. A range of other statutory consultees is prescribed in planning regulations for the purposes of public consultation. As the level of plan-making that is closest to local communities, either in urban or rural contexts, local area plans must be based on effective public participation and consultation with interested bodies. Participation and consultation in preparing Local Area Plans involves reaching out to two distinct groups (a) local communities and (b) interested bodies, for example the Department of Education and Skills, or the National Transport Authority. Public participation and consultation should be effected by means of a range of innovative processes, such as information sessions, workshops, internet-based mechanisms and focus groups, in addition to the more usual written consultation process. Careful consideration should be given to the timing of consultation events aimed at the community, for example at evening times, to ensure maximum public access to information about proposed local area plans. Social media can also be a useful mechanism in spreading awareness of local area plan preparation processes. Planning Authorities should actively seek ways to engage with the public and interested bodies and monitor the success of their approach both in qualitative and quantitative terms. Public participation and consultation in preparing local area plans must also take account of the differing types of contexts for such plans. In preparing local area plans for established towns and villages, the views of local communities should be particularly central to the plan-making process, for example, by examining the provision of essential local community facilities and amenities and objectives for their improvement where necessary. Submissions are also accepted from individual land and property owners. Contact Declan Noonan & Associates to put together your submission for your Local Area Plan or County Development Plan. Click here to return to Planning.